It’s been a hectic week or two, with big trips and settling back in, so expect a big ol’ My Hero Academia review catchup! After seeing several members of 1-A pass the exam last week, we see the continuation of everyone else’s battles. This episode is basically split three-ways. First up, the battle with the Human Meatball-Maker, as Bakugo and Kaminari continue their assault. What’s interesting about this particular battle is that you would assume that Bakugo would be the one to get the MVP title of this match, but that’s not the case; he quickly gets taken out and turned into a creepy meatball man. We learn more about Seiji, AKA Meatball, in that he feels the need to take it upon himself to thin the herd of those he deems unworthy to be heroes. 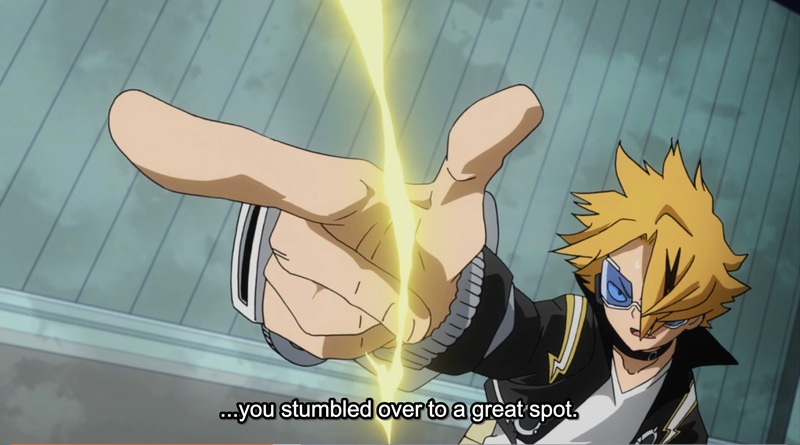 That said, he’s arrogant and in need of a little lightning in his face, and that’s where Kaminari comes in. Now better able to aim his electricity, thanks to some cool new gadgets, he can properly control his power. He also finds newfound respect for Bakugo’s ability to control his powers in order to protect his friends. Not inclined to let a little thing like being turned into meatballs stop them, his two friends deliver the final blow. Elsewhere, we get to see Deku, Sero and Ochaco all come together to capture their prey. 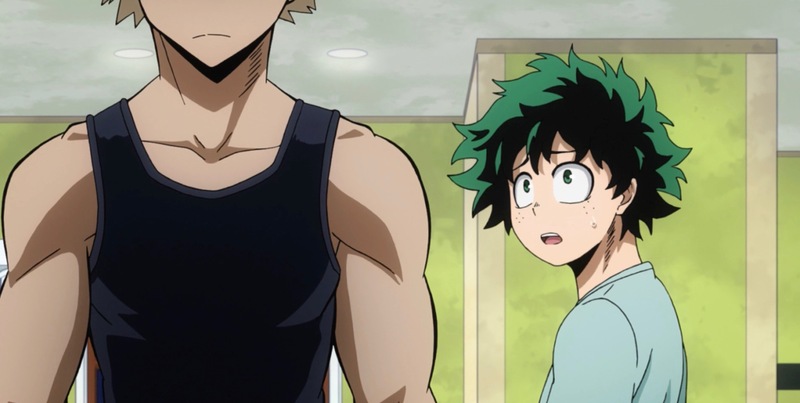 There’s a scene I love where one of the captured heroes tries to plead to Deku that he really, REALLY needs to pass this year and gain his license. 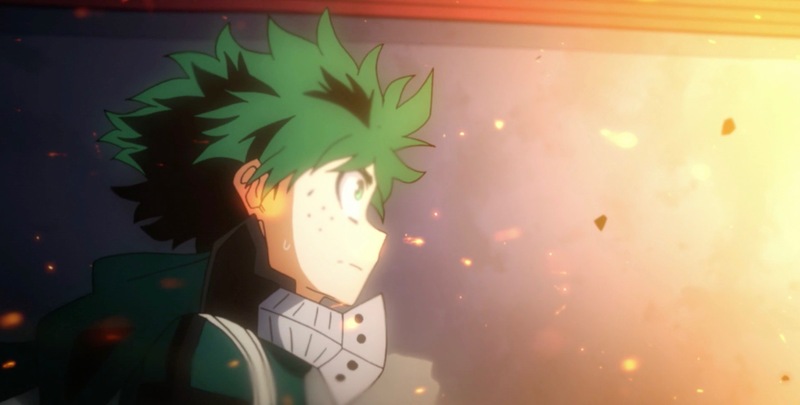 Now, on another show (or perhaps earlier in Deku’s character arc), the hero would’ve hesitated, wondering whether or not he truly deserved to pass instead of the other guy. But Deku is resolute; he just tags the guy out stone cold, saying that he himself needs to pass, and it’s pretty great. The last leg of the race features the 11 members of Class 1-A that have yet to pass. Laser Bellybutton Boy Aoyama has all but given up, with 2 of his 3 targets out, but Ida tries to reassure him. Bolstered, Aoyama pulls off a last ditch “suicide” attempt, drawing attention to himself so Ida can escape. Arguably, Aoyama could be considered someone with disability in a superhero society, since he can’t use his power without injuring himself unless he has support; a small, but touching glimpse into his life gives us reason to consider this under appreciated character. 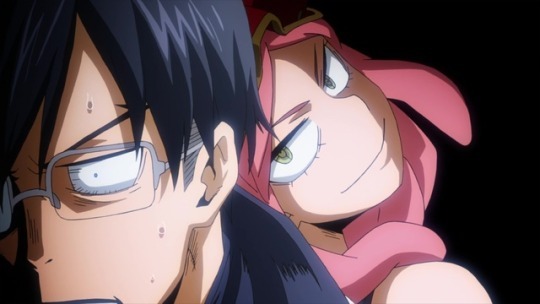 However, his sacrifice play has an untintended effect, as his laser serves as a beacon for all of 1-A to reunite, plan a counterattack, and pass the exam together. It’s a great moment all around, where we even get to see Toru’s actual quirk in action: Light Refraction. Now all of 1-A has passed, finally! This one veers away from combat and focuses on a less flashy, but no less important element of heroism: rescue. The exam field is turned into a disaster zone, with innocent “civilians” (actually paid professionals) caught in the debris; naturally, the 100 students who passed the first part of the exam must save them. The idea that the Help Us Company, or H.U.C., works with the superhero industry to train heroes how to react to crises by providing people to rescue is a logical bit of world-building that fits very nicely. I’m interested to see what else H.U.C. gets up to in the future. There’s a radical shift in tone as the kids go from fighting one another to working side-by-side, setting aside their differences for the greater good. Unlike the second-years, our 1-A kids are very inexperienced in this area, either unsure of what to do or making rash decisions that cost them. 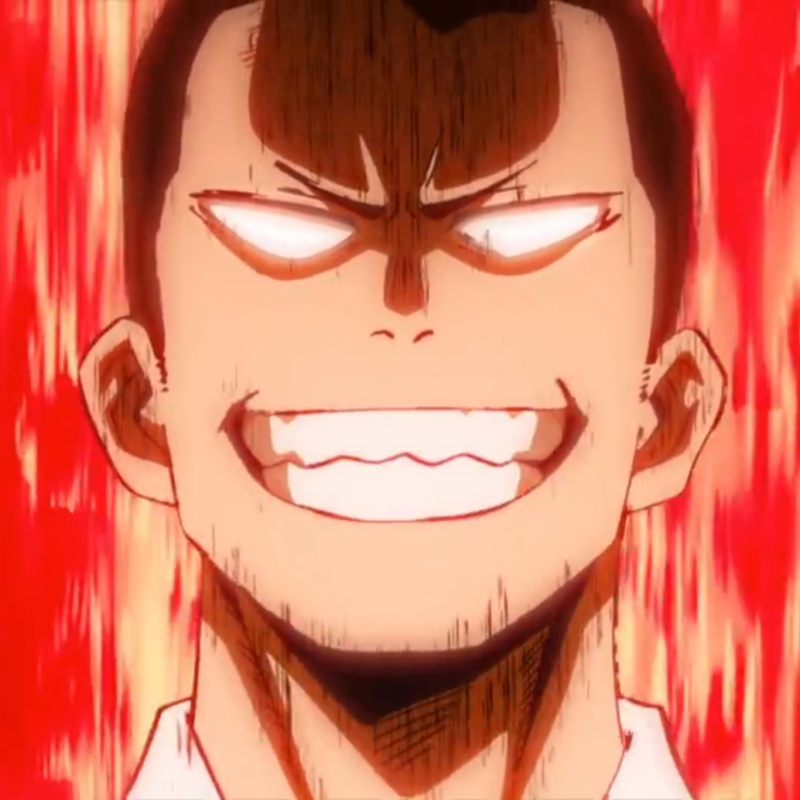 It’s interesting to see Inasa– a boy extremely gifted and in control of his abilities– struggle to perform rescues because he’s so impulsive. 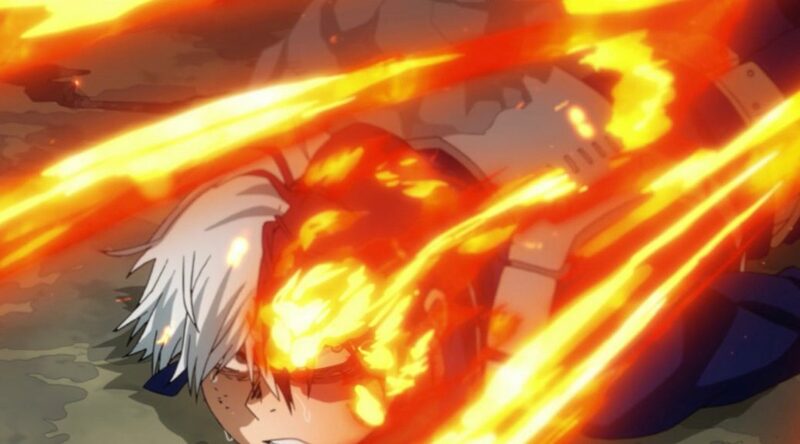 We also learn a little more about what his damage with Todoroki is, and it may just have something to do with Endeavor; the plot thickens. Real quick, let’s touch on Ochaco. I feel like she gets a lot of criticism thrown her way for being lovestruck for Deku, but…it makes a difference that she herself is aware of this. She’s aware her feelings for Deku and jealousy towards Camie are interfering with her goals, and ultimately decides that she has to suppress those feelings, at least for the time being. It’s a much more admirable approach to the problem than many viewers are willing to give her credit for. Not only must the kids work to save people, they now have to attempt a task considered hard even for pro heroes: fighting foes and saving civilians at the same time. Gang Orca, The Number 10 hero is on the attack, and posing as a villain. We’ll soon see the results of this…. …but not in this episode, because this one is a filler TV-special. For Japan’s Save the World With love Day, all the programs on the channel ran an episode relevant to the theme, so MHA gives us a side-story. This episode is two things. One: a pseudo-advertisement/setup for the My Hero Academia: Two Heroes movie (which I’m going to see later this month). These were easily the weakest scenes, but they weren’t offensively bad, just kinda meh. 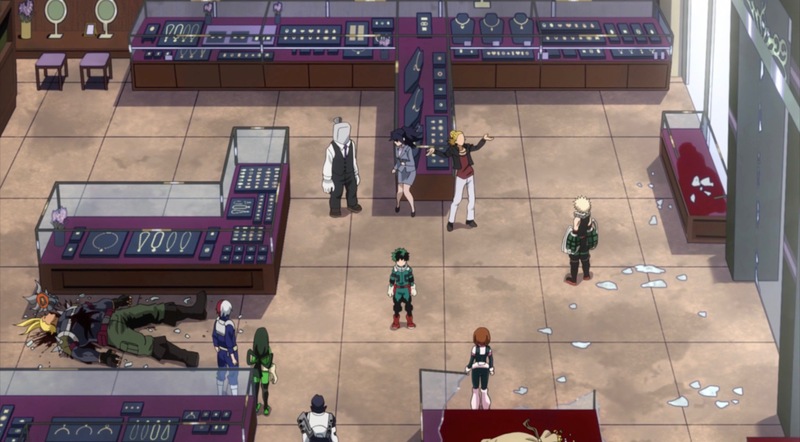 Two: a test exercise featuring Deku, Ochaco, Bakugo, Ida, Tsuya and Todoroki featuring a hostage situation. 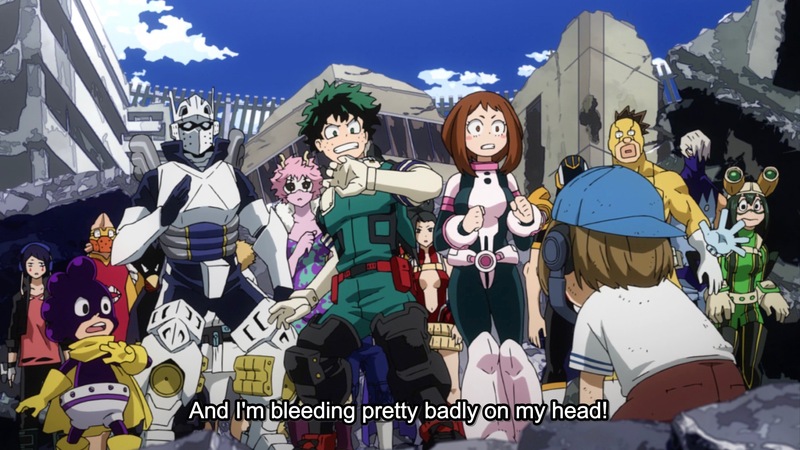 True to form, Ochaco is recon, Todoroki is talking with the kidnapper, and Bakugo rushes in and explodes stuff. Then the episode turns into, of all things….a murder mystery. The kidnapper (All Might in disguise, great design btw) is KILLED, and the three hostages are the suspected killers. We go straight Ace Attorney/Danganronpa as we interview the there hostage teachers, all played by Present Mic, Midnight and Cementoss, all of which are sporting amusing fake personas and casual wear. It’s a lot of questioning as Deku goes full Sherlock Holmes to get to the bottom of things, before deducing that the Kidnapper and Midnight’s characters had a relationship, that she called the cops and he took his life before this secret was exposed. However, it turns out the villain was still alive and fled, meaning Deku was wrong, meaning…meaning it’s not clear what the point of any of this was, actually. This episode felt like a premise the show was mandated to do and tried to get it over with as soon as possible, and it’s just not that interesting. I’m looking forward to getting back to the fighting-while-rescuing action of the exam next week. A phrase so simple, yet so powerful. Both in the context of the scene itself, and what it’s come to mean to fans of the show. This was the moment that I felt this was going to be something very, very special. But let’s start from the top. My Hero Academia premiered in Weekly Shonen Jump magazine about 4 years ago, the magazine home to such monster hits as Naruto, One Piece, Dragonball, Jojo’s Bizarre Adventure and many more. Written by Kohei Horikoshi, MHA tells the story of a world where 80% of the world have superhuman powers called Quirks and Superheroes have become a regular profession; they have about the same level of authority as civil servants, like firefighters or police officers. 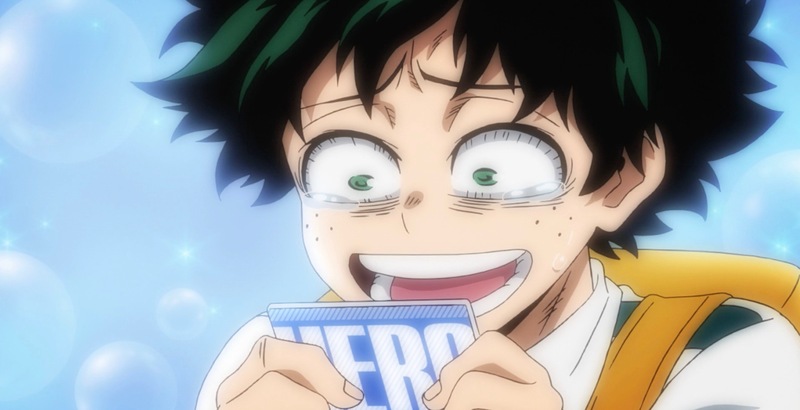 Izuku Midoriya is one of those 20% born without a quirk, despite his dream to be a hero all his own, much like his idol, All Might: a symbol of peace and one who represents the very best and brightest of heroism. One day, the two have a chance encounter that changes his life. That’s the initial premise, and after some gradual buildup it becomes a Battle Shonen school setting with all of the friendships, rivalries, tournaments, awesome fights and major conflicts that are typical of the genre. But to say that MHA uses bog-standard genre trappings feels dishonest, in a way; the implication is that the show is uninspired because of the use of those tropes, or perhaps uses them poorly. I feel the opposite: To me, this is the show that reminded me what good shonen anime is truly capable of, and why so many classic series worked so well in the first place. It’s not the awesome action scenes that made the show resonate with me; it’s the show’s emotional core, which is always front and center. 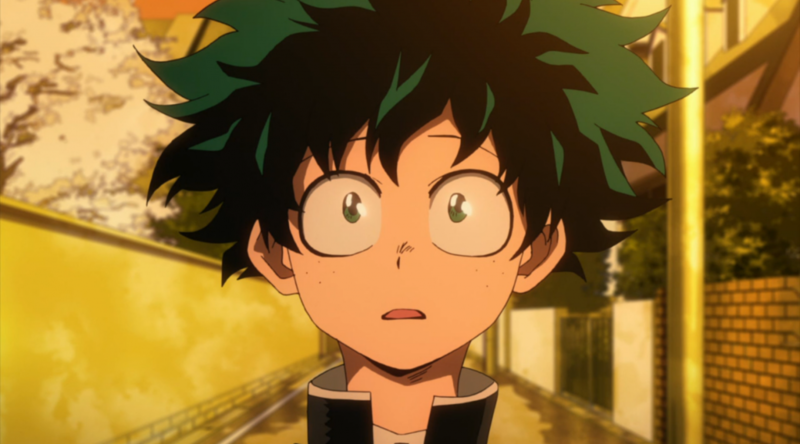 Izuku Midoriya, given the nickname Deku, is effectively judged at a young age to be worthless, broken, and strange. He has no power or ability, therefore he’s seen as an outcast. His struggle to reach his dreams, despite not having powers, feels real, painful, and inspiring, all at once. The powerful All Might seems like the opposite of Deku, but he’s revealed to be much weaker than he lets on; His muscular form can only be sustained for so long, and he reverts to a skeletal stick figure of a man when not saving others. 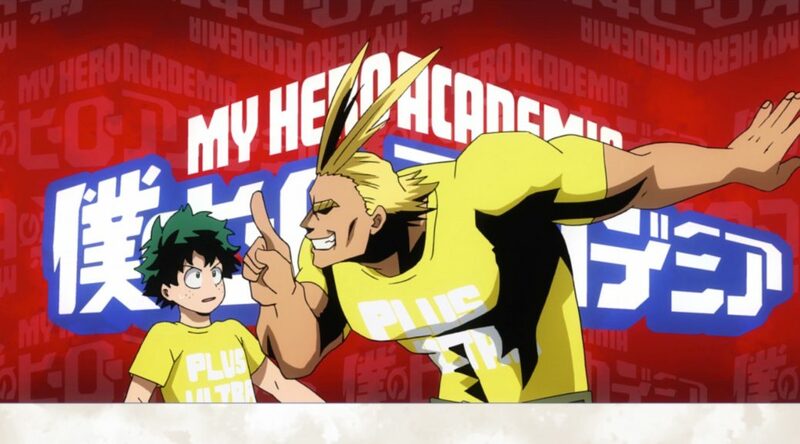 All Might at first writes off Izuku as someone who has no chance at being a hero without a superpower. However, during a major fight with a kidnapped student from Deku’s school, All Might cannot sustain his muscle form long enough to help. 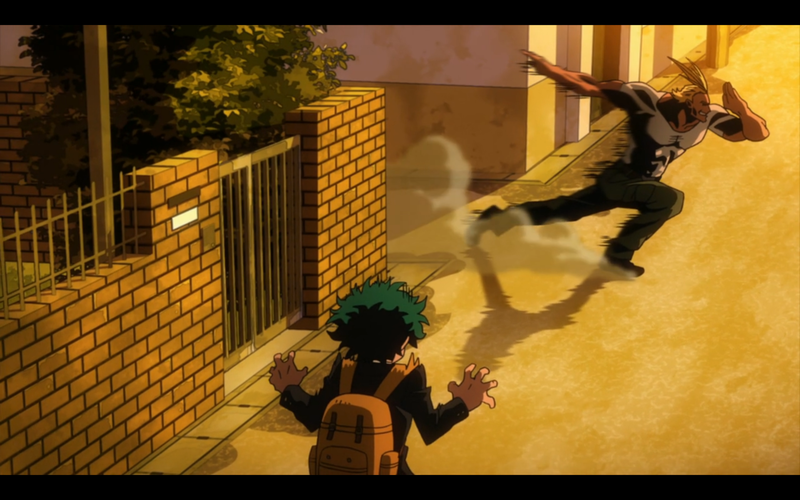 Everyone is helpless and has no clue what to do, until little Izuku– the powerless, quirkless little boy– rushes into the fray, to save a kid who has bullied him for years. He selflessly rushes in, when those with powers around him are unable or unwilling to rush to his aid, prompting All Might to act. Which leads to the scene we started with: All Might commends Deku, even if no one else will, because while what Deku did was reckless(or even stupid), All Might saw something no one else did. He saw that Deku is the kind of person who is willing to rush in and react before he could think, all for the sole purpose of saving another. And in that moment, this kid…this kid, who had been told all his life that he could never reach his dream, that he could never do anything, that he was never going anywhere. Now someone he respected deeply had told him that he had the power to reach his dreams, and become a hero in a way that no one else could. There’s so much I could write about when it comes to My Hero Academia, but that one moment spoke to my very core. I hadn’t felt that strongly about anything in a show for a long time, then this scene hit me in a way I didn’t think was possible. Izuku is sympathic to anyone who has ever felt loss, felt lesser, or looked down upon by society. No matter what your particular challenge is; be it a disability, mental illness, or a history of bullying– Izuku is someone you can see yourself in. 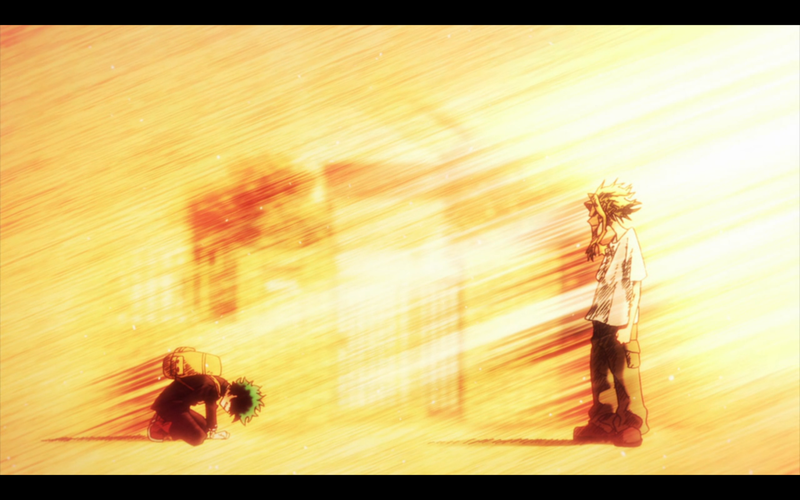 And when All Might (so proud, noble, and respected) told him he could achieve his dreams? It melted my heart. And I knew I was in love with My Hero Academia from the start. Early on, the show endears you to the main character’s struggle. But even as the story goes on, you’re so engaged with him the whole way that it makes the entire journey, from zero to hero, so gratifying. All the battles, all the friendships, all the amazing moments he earns feel rewarding in a way that’s truly unusual. In a few episodes this show does to me what other series struggle to do for their entire runs. There’s enough aspects of the world, characters, or the way the show tackles storytelling that could warrant their own article. [Editor’s note: I want that article. Get busy!] I am just here to say that I am a big MHA fan, caught up with the latest manga chapters, own all current English volumes of the manga and the collector’s editions for both Seasons 1 and 2 of the anime. Obviously, this is a series I’m greatly invested in, and I know that it has many more great stories to tell in the coming weeks. I hope you’ll join me.